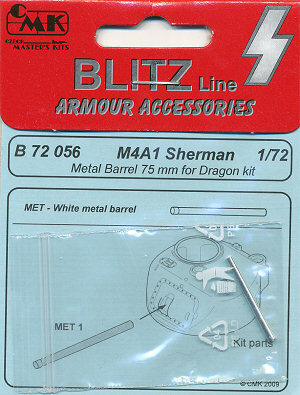 This barrel is marketed under CMK's "Blitz" line of armor accessories. Unlike their other Sherman gun barrel sets, this one does not come with any cannon shells or resin mantlet parts; only the gun barrel pictured above. It measures out very accurately for 1/72nd scale, and is shaped very well, and I think I can see a slight flare at the tip of the barrel. Although it is labeled as an M4A1 barrel, it can be used for any of the 75mm-armed Shermans.